Rechargeable Led Road Flares 6 Pack is agreat device to Identify Road Hazards, Mark Detours, Underwater Repair. Keep in your car ready for use in a breakdown or emergency situation at the roadside. When you’re driving on the road, it is essential to keep in mind that anything can happen to you as well as your vehicle anytime. You car could crash, you may get a flat tire, you could even face a mishap or come over someone. You can handle these situations successfully only when you are well prepared. One best thing you can do to handle such situation is have an emergency kit in your vehicle. 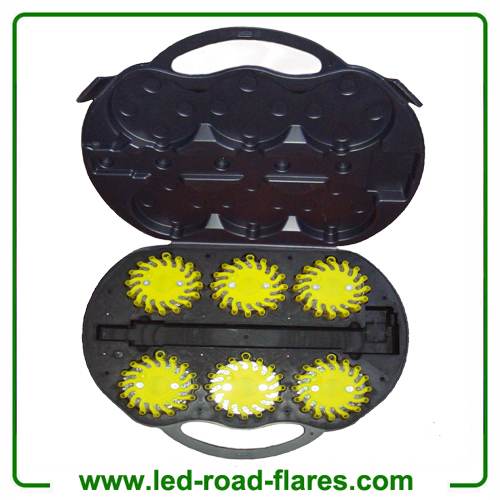 They generally contain LED road flares, road cones waterproof matches, flashlights and emergency light sources. There’re, of course, several uses of an emergency light supply in your car, particularly if you’re in an accident, have a flat tire, of if your car malfunction. As far as emergency lights are concerned, most experts suggest having a LED light supply in your vehicle since they produce better light than conventional emergency light source. They also have a brighter and further reaching light ray, and available in smaller and compact size. Flag down traffic for help: If you’ve no working lights LED road flares will keep your car visible. You can even employ the light to perform as a taillight. This’ll permit approaching traffic to notice you and be able to get out of the way and avoid hitting you. Perform as a flashing signal-light: Led road flares or emergency light can perform like hazard lights on your car, once again awaking other drivers regarding your whereabouts. Check what is wrong with your car: If you’ve no power, you can be able to sort it out yourself, but it is rather tough to do on a dark road during night with no lighting. An LED road flare or emergency lighting source can assist you look into the issue with your car and perhaps help you in making the repair. Assist you repair a flat tire: With a power LED light on your hand you can even able to see everything clearly and repair your flat tire. In the event that you are in an accident, a flashlight can come in handy for many reasons. It can help to survey the damage of your vehicle or the other vehicle or vehicles involved in the collision. You can also use it to flag down other vehicles and warn them of your presence on the roadway. In some cases, you may also need to navigate uncertain terrain, such as a field, either to get to a collision scene to help, or escape from one.